Review: Wahl Motion Lithium Ion Clipper — Best Clippers For 2018? 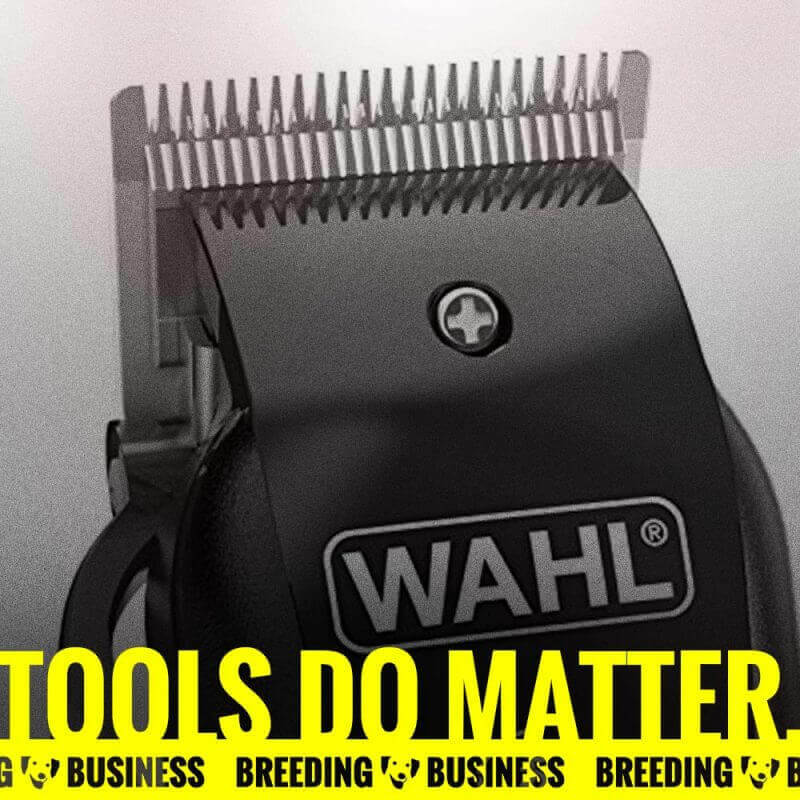 The Wahl Motion Lithium Ion Clipper is to us one of the best purchases you can do in terms of pet grooming. These professional dog clippers aren't cheap but they boast a lot of great features turning them into a no-brainer purchase. Finding the right professional-grade grooming clippers is a tough mission, there are just so many aspects to consider. Quietness and low-vibrations matter a lot, especially with anxious dogs, but you do need the power to glide through thick and coarse coats, too. Additionally, working with heavy-duty material such as the Andis Super AGR+ clippers is often recommended, but they are heavy and will cause wrist fatigue soon after you start using them. So, you need a piece of technology that is durable, well-built, yet remains lightweight. You also want clippers powerful enough to facilitate bulk trimming, but they need to remain cool and quiet for precision works. The Wahl Motion Lithium Ion Clippers do just that! Plenty of upsides with these Motion Lithium Ion Clippers, conceived by the world-renowned salon brand, Wahl. For years, the brand has released plenty of grooming appliances and these clippers are at the top of their heap. 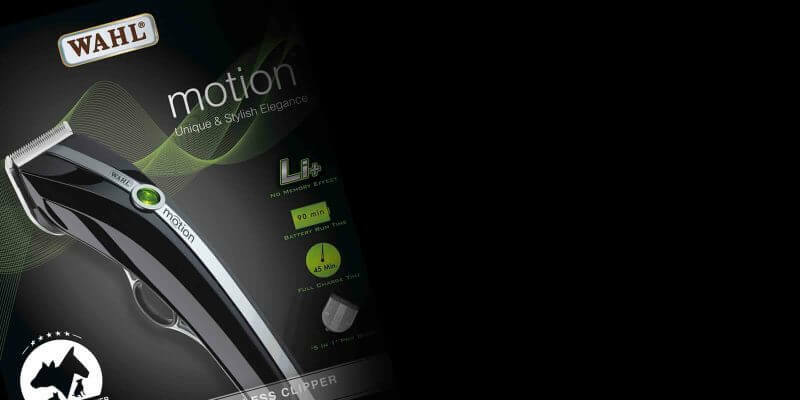 The Wahl Motion Lithium Ion Clipper can be operated either in corded or cordless. This technically means that you can use the clipper without the wire for portability, with a runtime of up to 90 minutes, or with the wire for extra power and longer runtime. Lithium ion batteries are very much known for their high capacity voltage and longer running times. Many electronics such as mobile phones and cordless power tools use lithium ion battery instead of the conventional battery. Lithium ion is known to be a replacement for Ni-Cad batteries in the past. Lithium ion batteries usually are at 3.6 volts of power in most mobile phones and in other tools such as our lithium ion clipper here. This number is quite powerful in comparison to 1.2 volts of a nickel-based battery set, which means that lithium ion is about 3 times more powerful than Ni-Cad batteries. No memory effect – does not lose battery life over time or does not self-discharge a lot. Prevents overcharging, over-discharging and overheating due to its smart electronics. Longer durability in comparison to nickel-based batteries. In addition to that, the convenience of switching between corded and cordless is the fact that you can use it at home or on the go. Most people don't like cordless devices because it has limited power and runtime, whereas some users don't like corded ones because it is an accident-prone feature. Also worth noting: the battery indicator is a unique traffic light style system, in which green means it's fully charged, orange means it's around 25% to 50% charged and red means that it's less than 25%, so you'll find it easier to know when to charge your clipper with the included charging stand and charger. As a 5-in-1 blade designed groomer, you can choose from various adjustable sizes from #9 up to #40 to set your desired pet hair length. This will allow you to save more time and money because you don't need to purchase other blades or tools to style your pet. Choosing between blades is important because not all dog breeds have the same hair length. For instance, matted coats may need the size #7 blade for heavy matting and size #5 for light matting. It is important to know that blade numbers that are lower means that you'll leave more hair on your pet. If you're not sure what to decide then choose the #10 blade – which this clipper also has. In addition to the interchangeable blades, the attachment guides in this grooming clipper amount to 6 combs for various lengths, from 3 mm (1/8 inch) up to 25 mm (1 inch). Combine the interchangeable combs with the blade variations and you can open up your own dog grooming salon! It is hard to find a clipper that is both lightweight and powerful, but the Wahl Motion Clipper is quite balanced in weight at only 9.4 ounces. 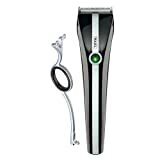 Battery powered clippers tend to be heavy because they have a battery in the system whereas corded ones tend to be lighter, but this one is in the Goldilocks zone. This technically means that you will have less user fatigue for your wrists, which means a safer dog grooming session, especially if your pet frequently moves about. The scissor grip handle of this clipper also makes it easy to grip ergonomically so you feel at ease when grooming your dog. Wrist fatigue is a dangerous thing to have when you are grooming dogs and people because of the potential accidents that can happen. Therefore, it is important that your clipper is not too heavy to carry around so you can focus more on your dog clipping rather than the tool. In addition to the light weight of the clipper, it is also smooth in its operation as it can glide through your dog's coat and is safe to use on your pet's face and feet. It's also great for finishing touches for your pet's grooming session. In addition to its good amount of weight, it is cool on the hands, has low vibration and is not noisy at all. Having a quiet clipper is very important for pets because they can get easily startled when they are being groomed with machines. The fact that it has a speed of 5,500 SPM will surprise you because of its minimal vibration and low noise levels. Higher speeds means more hair will be removed faster to save time. Having great dog clippers does matter. In all honesty, there is not much to dislike. However, there are a couple of points we believe could be fixed perhaps in a future version few years down the line. But these small improvements are unfortunately related to great highlights. For example, you cannot really have heavy-duty clippers that are lightweight — so you've got to pick your side! Like most grooming tools, you can only get replacement parts for this clipper when it is under its warranty. Otherwise, replacement parts might be a bit sketchy outside in the market unlike other brands which can be replaced by aftermarket components. Some users have claimed that this pet clipper is not as strong as heavy duty salon-grade clippers. This is because of the fact that using it for 3 to 6 dogs a day may easily exhaust it when overused, since it is mostly meant for home grooming and some light to medium salon grooming, but not for true heavy duty usage, since it is partly cordless. Most cordless tools tend to be behind true corded ones. As a whole, we give an overall positive verdict to the Wahl Motion Lithium Ion Clippers due to its ton of great features and beautiful (yet solid) build. It will keep your wrist at ease and can work on a variety of breeds such as Pomeranians, Poodles, Labradoodles, Spaniels and so much more. The price shouldn't be a worry, it's a premium and professional product in comparison to other clippers and trimmers out there. Eventually, it will pay for itself in the long run. If you keep about 1 to 3 dogs and need to clip them at home instead of in a salon, you can definitely do it with this dog groomer. Look at our review of silent dog clippers if you are dealing with anxious pets.